Harlem Street Singer: The Reverend Gary Davis Story tells the story of Gary Davis, one of the most underrated musicians of our time. Though Davis has had a huge influence on many well-known musicians, including Bob Weir and Jerry Garcia of the Grateful Dead, Jorma Kaukonen of Jefferson Airplane, David Bromberg, Bob Dylan, Woody Mann, Dave Van Ronk, and Townes van Zandt, his story has gone virtually unknown until now. Davis, who became blind as an infant, was born in South Carolina and worked his way up to Harlem in New York City where he was ordained as a Baptist minister and began preaching and playing on street corners. 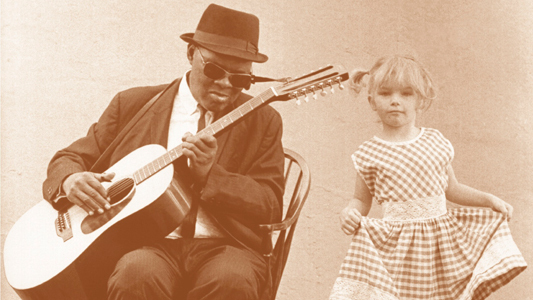 He was a master guitar player with a unique finger picking style and was a blues, ragtime and gospel music virtuoso. His guitar playing was complemented by a soulful voice that defined feeling. The first official screening of the documentary was back in January 2013 in Boston, MA, but now screenings have been added in New York, NY; St. Louis, MO; Anchorage, AK; and the UK, for November and December as part of several film festivals – info for those is here below. Harlem Street Singer – The Reverend Gary Davis Story is a new documentary that tells the story of Gary Davis, one of the most underrated musicians of our time. Though Davis has had a huge influence on many well known musicians including Bob Weir and Jerry Garcia of the Grateful Dead, Jorma Kaukonen of Jefferson Airplane, David Bromberg, Bob Dylan, Woody Mann, Dave Van Ronk, and Townes van Zandt, his story has gone virtually unknown until now. The first official screening of the film will take place this Friday, January 25, 2013, at 6:30pm at the Institute of Contemporary Art in Boston, MA. The screening will be followed by a live performance by Woody Mann, Paul Rishell, and Annie Raines. Tonight’s episode of The Green – Big Ideas for a Small Planet is entitled “Grow” and focuses on the importance of green space, especially in our cities. Humans have interrupted the natural flow of plant growth with the building of concrete jungles, but there are steps that can me taken to balance out some of the harmful effects. In addition to the environmental impact, there is also a social cost of decreasing green areas which includes obesity, increased stress levels, respiratory diseases, and diabetes to name a few. When thinking of environmentally friendly activities to include in their daily routines, most people will likely consider the more common things like recycling, decreasing auto emissions and air pollution, taking public transportation when possible, using energy saving light bulbs, etc. All of these are extremely important and making them priorities will contribute to keeping our planet green and healthy. The fact is that all of our daily activities should be made with the environment in mind. This is the idea behind the Sundance Channel‘s weekly environmental series, The Green. For instance, most people don’t relate fashion choices to the environment. Tonight’s episode of Big Ideas for a Small Planet: Fashion focuses on fashion and tells us why something as seemingly innocent as buying a pair of jeans does have a significant impact on the environment. SATURDAY, APRIL 26, FROM 10 A.M. TO 4 P.M.
Universal City, CA—The Universal Studios Hollywood “Eco-Fair” returns on Saturday, April 26 from 10 a.m. to 4 p.m. as The Entertainment Capital of L.A. celebrates Earth Day with over 30 engaging and educational displays, celebrity appearances, an offer of free parking for hybrid vehicles, and a hazardous waste disposal drive sponsored by the City and County of Los Angeles. “The Office” star Melora Hardin and Lauren Koslow from “Days of our Lives” will autograph eco-friendly bags and help dispense energy efficient light bulbs at the Environmental Media Association’s booth. Designed to captivate the imagination of guests, the free Eco-Fair will also include interactive exhibits by Bell ’s Bugs, La Knitterie Parisienne and the Hollywood Beautification Team. The Sundance Channel will begin airing tonight the second season of its award-winning series, The Green. The series is television’s first regularly scheduled program dedicated to the environment and is brought to us by the producers of Queer Eye for the Straight Guy. The Green is presented by Robert Redford and hosted by environmental journalist Simran Sethi and community advocate Majora Carter. Recurring expert commentators will include scientists, inventors, entrepreneurs, and Talking Heads frontman and bicycle advocate David Byrne. Each episode will focus on a different environmental theme as well as various innovations that can help us to understand and deal with the related issues. Topics range from climate change to fashion to consumer gadgets. Tonight’s episode entitled “Big Ideas for a Small Planet: Power” will explore alternative energies. Innovations dealing with clean and renewable energy sources such as solar energy, wind energy, and even cow manure will be discussed. Next week’s show will introduce viewers to common household hazards as well as safe and green ways to decorate and maintain a home. One future episode will focus on several individuals who are bringing green to fashion, clothing stores, and dry cleaners. 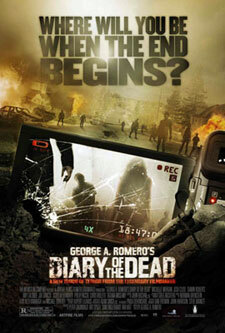 Zombie master George A. Romero brings the dead back to life for the fifth time with his latest film, Diary of The Dead. This film follows Night of the Living Dead (1968), Dawn of the Dead (1978), Day of the Dead (1985), and Land of the Dead (2005). Diary of The Dead revolves around a group of college film students who are attempting to film their own horror movie. Much to their surprise, strange things start happening while they are filming and their movie quickly becomes a documentary of an unexplained phenomena taking place throughout the world. The students’ motivation for filming the movie changes from GPA to their newfound obligation to inform any survivors of what is really happening. After seeing falsified news clips, the students felt that when uploaded on the Internet, their documentary would show the unexplained horror for what it really was, should normalcy ever return. “ECO-FAIR” AT UNIVERSAL STUDIOS HOLLYWOOD PRESENTS NEW, INNOVATIVE AND FUN INTERACTIVE “GREEN” EXHIBITS AND DEMONSTRATIONS ON SATURDAY, NOVEMBER 10, 2007, 10:00AM – 4:00PM, A FREE FAMILY EVENT AT THE ENTERTAINMENT CAPITAL OF L.A.
must-see “Green” family destination on Saturday, November 10 from 10:00 am to 4:00 pm. Admission to the Eco Fair is free (but does not include theme park admission). I found this too geeky to pass up. Brian May, the 59-year-old guitarist of the legendary rock group Queen, has just completed his PhD in astrophysics. His thesis was on interplanetary dust clouds. May left school over 30 years ago to contribute to the world’s pool of quality music. After recently co-authoring a children’s science book with astronomer Sir Patrick Moore — Bang! The Complete History of the Universe — his interest was again sparked. He decided to go back to school and finish up what he started. He dug up his notes from 33 years ago, which he found in his loft, and picked up where he left off. See, I always felt that it pays to be a pack rat. Congratulations Brian! An admirable accomplishment indeed. Evan Almighty, which opens tomorrow, will have a green message attached to it. I am not referring to the green message that most films carry with them in their hope to make money. Nor will the movie’s posters be colored green or have the Geico Gecko telling you to go see the movie. This green message involves the environment. Universal Pictures, with some help from its sponsors, is spending roughly $25 million on its Get On Board eco-awareness campaign, with a website created in conjunction with The Conservation Fund. The campaign will give audiences tips on how to help stop global warming while advertising the film at the same time. The educational site includes the Almighty Forest, where you can plant a virtual and a real tree for a mere $5 donation. A cool little extra is that contributors will have their name included on the film’s DVD.